Safety challenges can pop up all around your business, from receiving food at the back door to serving guests in the front of the house. Use these Safety Tips and Guidelines to make sure your employees and customers are safe at every stage. Millions of people become sick after eating contaminated or mishandled foods each year. 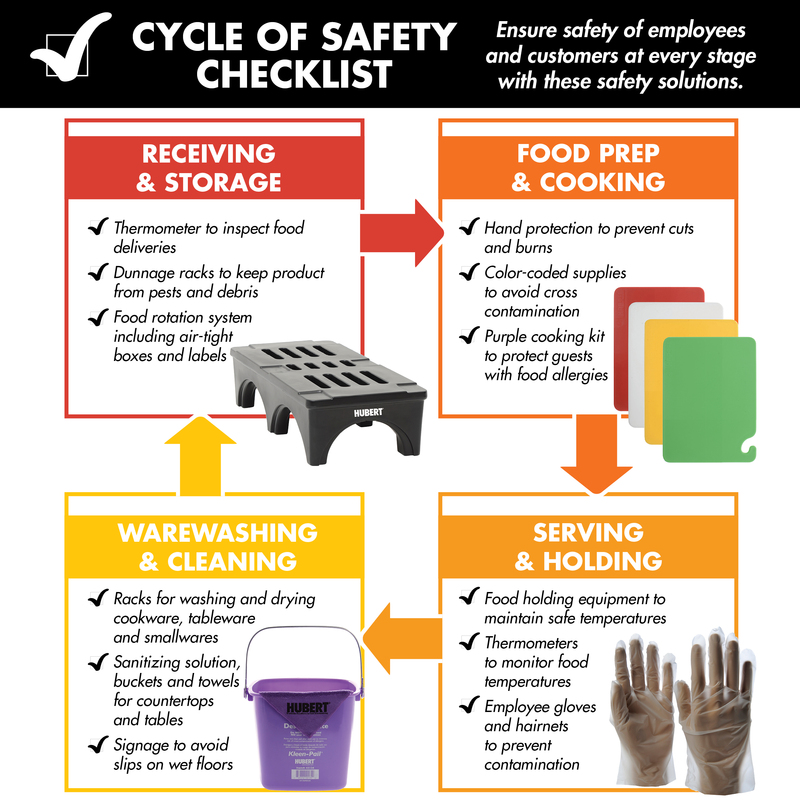 Food safety and standard operating procedures need to be developed throughout a foodservice operation to prevent foodborne illness outbreaks. Safety starts at the back door. Hubert can help you with food rotation labels, food storage and transport tools. OSHA estimates that hand injuries cost the food service industry about $300 million per year in workers’ compensation costs and lost work time. Hubert can help safeguard your staff from unnecessary injury. 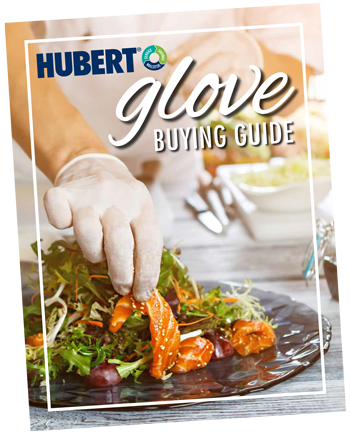 Whether they are slicing veggies, pulling out a hot pan or handling raw meat, using the correct glove is essential to keeping your kitchen environment safe. Learn more about glove materials and features in our Glove Buying Guide. If space allows, create dedicated prep zones in your commercial kitchen to help avoid cross-contamination. For example, one area to prep meat, another for produce, another for seafood, etc. Using color-coded tools, such as knives and cutting boards, is an effective way to create contamination-free prep stations. Colors are often used to identify certain food groups, which minimizes the risk of cross-contamination. Below are the suggested food types to be used with each color. Make sure everyone working in the kitchen knows the color-coded system by hanging a reference guide where employees can refer to it easily. Shop Cutting Boards and Knives. What customers see and regulators say matters. An effective sanitation program is necessary to the overall success of any food handling operation. Hubert has all the cleaning supplies & tools you need to stay clean and compliant. The right holding equipment is essential for maintaining safe food temperatures in a busy kitchen. Holding equipment should be selected based on the volume and type of food, as well as service style. The goal is to minimize the time food is in the “danger zone.” This ranges from 40° to 140°F. Food that has not been cooked or cooled quickly enough can become ripe for bacterial growth. This puts customers at risk for food-borne illness. According to the U.S. Food and Drug Administration, bacteria doubles every 20 minutes when allowed to thrive on food left at room temperature. 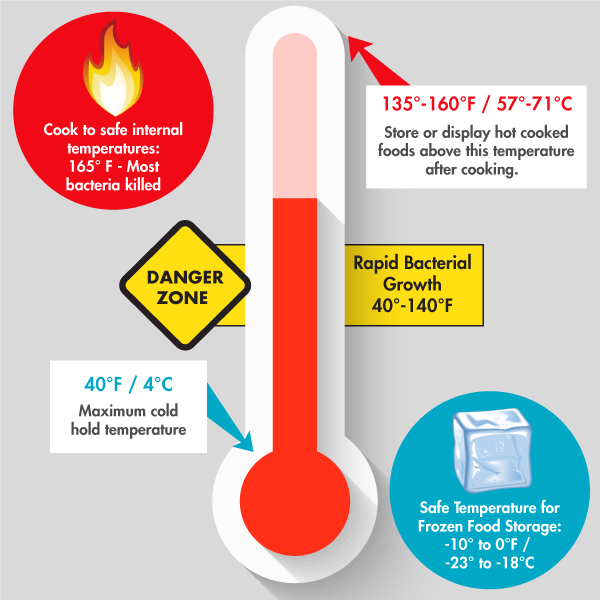 This infographic shows the temperatures at which hot and cold foods can be safely held. An estimated 15 million Americans report a food allergy, which impacts their decisions about where to eat and shop. People with food allergies are put at ease when they see purple, the universal color for Allergen Awareness. Create a plan: What tools and procedures are needed to keep your kitchen area compliant? Use color coding: Separating foods within the kitchen (and dining room) with color-coded products will help eliminate cross-contact. Learn more about allergen awareness at blog.hubert.com or shop Allergen-Safe Products. All around your business are opportunities to practice proactive safety. Hubert is your source for necessities like first aid, floor mats and more. Keep your first aid kit full to quickly sanitize and bandage small cuts and burns. Glove dispensers should stay stocked with a variety of sizes. Wet Floor Signs are essential for both your staff and customers. They warn people to take extra caution when walking in these areas. Slip-resistant mats are ideal for kitchen floors or other high traffic areas. Rubber mats offer better foot grip and provide a softer and more comfortable walking surface, which gives the feet, knees and other joints better protection from strains and other injuries. Have back supports available and train employees to utilize proper lifting techniques that place minimum stress on the lower back. Keep in mind, it is vital that your staff is educated on the importance of First Aid essentials and know how to properly use safety gear.